I don't know if a Nichijou license that they're leaving ignored for now can be pried out of Vertical's arms, but I'd like this novel from any publisher willing to take a chance on it. I saw the cover in Arawi's Helvetica Standard. There's a few other books with Arawi's art, but this has his characters. One of the weirdest manga / anime comedies in existence to me. Japanese centric puns, Malaysian language based jokes, and just a general sense of randomness to the happenings. 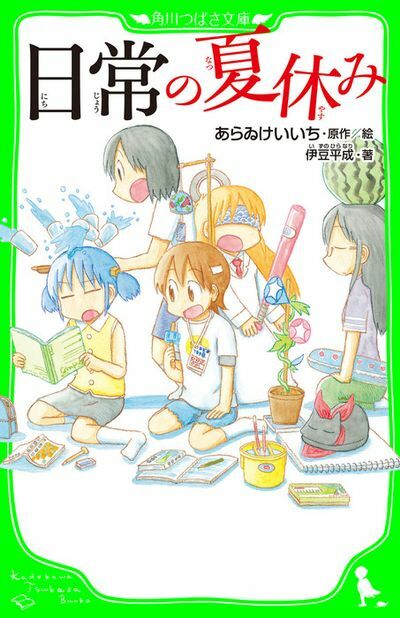 The title, Nichijou, has been translated as "My Ordinary Life". It has a healthy cast of characters interacting together, from a robot who takes care of her young professor, to perhaps the trolliest girl with glasses in anime interacting with her academically challenged classmate and mangaka focused classmate, to students that play a combined game of Go and Soccer (with rules only a select few understand). What do you Know About the Novel? Not too much. The opening of the book has character descriptions that mention things about them, from a very simplistic reading of their hobbies (Mai's appreciation of Buddha), to the very random pull of specific moments from the original work (fear of dogs from Hakase). Makes me think they'll play on these specific personality traits + build on previous moments already outlined in the story (but hopefully not just a rehash of greatest hits). Is Arawi the author on this? No, which may be a hangup for some. I don't know how much Arawi's was involved in the process besides drawing the cover and a lot of little doodles on the page borders. This seems to skew younger than JNC's audience, I think it's recommended for Middle Graders. The page count is low (216 pages). What's the Reception For This One Like? It's got 12 reviews on Amazon and holds a 5 star average. People seem satisfied to get another story with their favorite characters. You Mentioned Other Novels With Arawi's Art? Links PLZ? I'm bumpity bumping a few of my threads since there's a really good Bookwalker sale (and coin up period that lasts until October 2nd in Japan) going on on Bookwalker JP. The first Nichijou volume is only 320 JPY right now, so I grabbed it. I got around 170 JPY back in coins, so not too bad.